I recently held a seminar for those who are interested in hummingbirds. As a volunteer for the Texas Parks and Wildlife Hummingbird Roundup, I have learned a lot about hummingbirds over the last five years. I will share more later about the species I have seen and photographed. For this blog entry, though, I think it best to help my friends understand how they can best care for hummingbird feeders. 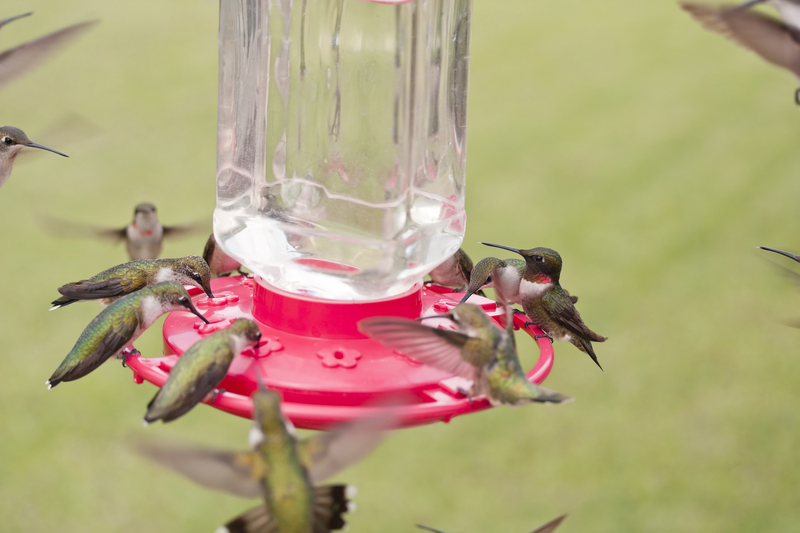 There are a variety of hummingbird feeders on the market. It does not matter what kind you use. The object is to have a feeder which will enable hummingbirds to get nectar, much as they do from flowers in the wild. That is what a hummingbird feeder actually represents to a hummingbird – a source of nectar, like a giant flower. What is important is that the nectar (sugar water solution) represent what they would find in nature. 1. Make your own nectar instead of buying a store nectar solution. Store supplied nectar will contain red dyes and possibly preservatives, which are not helpful to the birds. It is best to make your own solution and it is quite easy. The recommended solution is 1 part sugar to 4 parts water. For example, mix 1 cup water to 1/4 cup of sugar. Stir the solution until the sugar dissolves. It is not necessary to boil the solution. The birds don’t really care. I make mine and put it out immediately. 2. Change out the solution after a period of 2 – 5 days. The sugar solution will grow bacteria and go bad if it is left out too long. This is one of the mistakes many make. They let the feeder get black with insect droppings and never change out the feeder. If you change the feeder regularly, it is actually easier to keep it clean. You don’t want to wait until you see black junk on the ports. Frequently changing the solution will make the change out much easier for you. Simply rinse the feeder with hot water, add more solution and put it back out again. If you need to clean the bottle get a bottle brush and gently rub the inside of the bottle. You can get small brushes to clean the ports as well. I seldom do much more than this. I even keep a feeder out year round. However, if you let black droppings cover the ports, you have to stop and wash the feeder in dish washing detergent, which is a big bother. Be sure to rinse it very well if you use detergent. I try to regulate how much solution I put out depending on how many birds are feeding. During Fall migration, I will put out large amounts. During Summer and Winter, I use put out much less. I change the solution regularly. I just make less of it at times. 3. Keep ants out of the solution by using an ant moat. You can buy ant moats at Duncraft.com or Amazon.com. You can even make your own. I make them out of spray paint can lids and suspend them with copper wire. Ants will turn the ports black quickly. They cannot cross water, so an ant moat keeps them off of the feeder. 4. Never put honey or any other sweetener in the solution. Honey will introduce bacteria and fungus spores and can be dangerous for the birds. All they need is sugar and water. Keep it simple as nature. 5. Red attracts hummingbirds. However, it is not necessary that the red be in the nectar. The red should come from the feeder, not the solution. Never add dyes to the nectar. Go pull apart a flower and look at the nectar. It is clear. You are offering the bird what he would get in a flower, so keep it simple, just sugar and water. Hummingbirds do not get nutrition from the nectar. Nectar is their energy drink. They get their nutrition from eating tiny insects which they find on flowers or flying in the air. 6. You don’t have to worry about interrupting the migration patterns of the birds by having a feeder available. The feeder is just a flower to them. The biologist confirm that feeders have no effect on the migration timing of birds. They will leave when they choose to do so. Ruby-throated hummingbirds have a unique trip they make for migration compared to the other species. Ruby-throats fatten up at the feeders so they can fly across the Gulf of Mexico. They are the only hummingbird specie I know that does this. That is why they hang around for a while on the South Coast areas feeding before they take off. Sometimes hundreds will gang up on a feeder because they are desperate for nectar before they make the flight. 7. In South Texas we have hummingbirds in the winter months. I keep one small feeder out during winter because a few hummingbirds will winter in our area. It is tricky, but I have found a way to keep the feeder from freezing during cold days. I use a plate warming tray (ele.) and place a ceramic plate on the tray. I then place the plastic feeder on the plate. The warmer gives enough warmth to keep the solution from freezing. My reward is to see an occasional hummingbird. I have had Buffed-bellied, Rufous and Annas during winter. Have fun and enjoy the hummingbirds.